Misc SCJs | Walk with us! 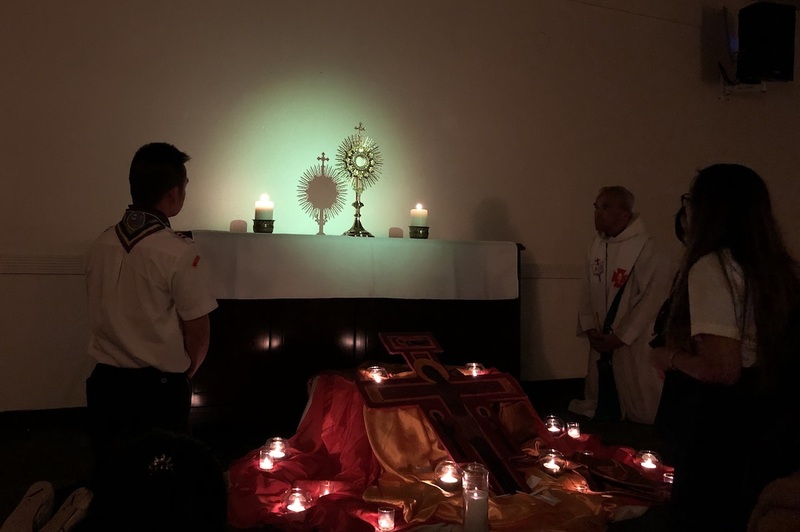 While Sacred Heart Seminary and School of Theology was on its spring break two weeks ago, I had the opportunity to attend the Vietnamese Eucharistic Youth Movement (VEYM)’s Annual Servant Leader Retreat – 2019 in Rosemead, CS, at the St. Joseph Salesian Youth Retreat Center. It was directed by Fr. Tri Dinh, SJ. The retreat was called Hành Trình Hy Vọng: The Heart of Faith, (English translation of Hành Trình Hy Vọng is “The Journey of Hope”). When individuals in the movement ask why I joined the SCJs out of all of the religious orders out there, I tell them, it’s simple – I felt like I was at home from the start and it is because of VEYM that I am an SCJ. Being in VEYM continues to reinforce my vocation of Ecce Venio. Recently, I read a post by the president of VEYM in the United States and it dawned on me that the SCJ charism was nurtured in me way before I knew what that meant. The VEYM is the youth branch of the Eucharistic Youth Movement (EYM). The spirituality of VEYM and the SCJs is not that far apart as members in VEYM are taught to Live the Eucharistic Day which is comprised of three parts: Morning Offering, Mass and Holy Communion, and lastly, Night Offering. These aspects of Living the Eucharistic Day remind me of Oblation, Reparation, and Adoration. As the Eucharist is the source and summit of our Christian faith, in VEYM, we have Mass and Adoration daily. During this retreat, we were first asked “How is your soul” in order to reflect on our journey of faith and how we got to where we are today. As I discern this question and my journey of faith, I am loved by God and I want to share that love with the world. It then got personal, I was asked, “Who is Jesus to me” and I thought of my personal relationship with Jesus, as my Shoshben, as someone whom I can talk to on any level. I took notice that I had to reprioritize my life and see what is important to me and how to make God more present in my life. The past, present, and future: I understood that how I got here leads me to immerse myself in the present moment, to discern where I go from here. I know I was meant to be on this Journey of Hope: Heart of Faith as it was the same weekend as St. Polycarp’s 25th Year Anniversary as a VEYM chapter (I had joined VEYM at the age of eight at St. Polycarp, Stanton, CA). The weekend renewed my spirit, my Dehonian spirit. I was reminded to let go and let God. I pray that I am able to accompany and walk with others on their own journeys and really be available to them. As I came home to Sacred Heart Monastery, I stumbled upon a painting in the stairway that was hung up after I had left for the retreat. 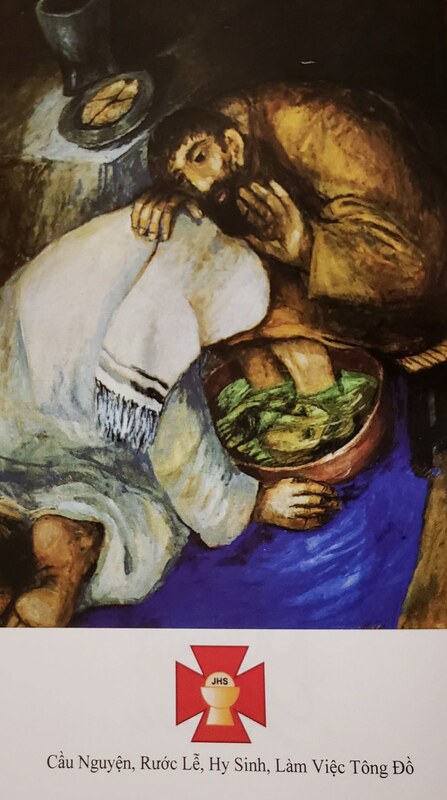 The painting was of Jesus washing the feet of one his disciples. At the retreat, we reflected on the reading of Jesus washing the feet of the Disciples and this same image was used. Although I was tired from traveling, I couldn’t help but be in awe. Jesus is the true message of servant leadership. Currently, my involvement in VEYM is both at a local chapter and the national level. 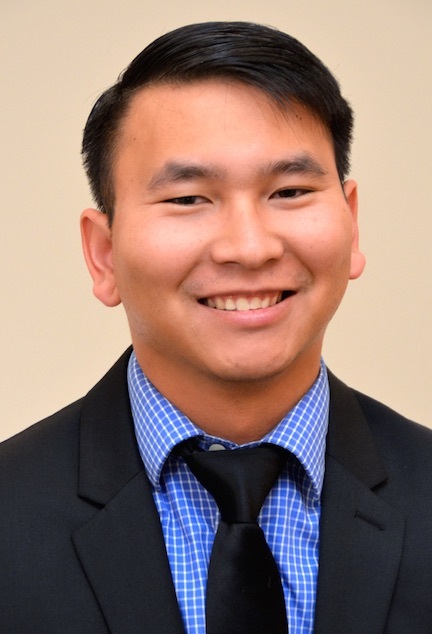 I was elected as the Vice President of Academic Affairs at Dong Hanh chapter in Franklin, WI (at St. Martin of Tours) and recently appointed as the Sub-Committee Lead of Vocations of the National Executive Committee. Do you feel called to religious life? Contact our vocation office for more information about the Priests of the Sacred Heart (Dehonians). Click here to email the director; or call 800-609-5559. The recent Synod on Youth convened by Pope Francis urged the Church to listen to young people and create spaces for them to express their ideas, feelings and hopes. It was with this in mind that I attended the La RED meeting in Chicago, November 8-11. Approximately 100 of us from around the country took part in the meeting. We were joined by the auxiliary bishop of Chicago, Bishop Alberto Rojas. It was significant for us to have a young bishop among us, one who has been active in youth ministry and who endorsed our mission to accompany and encourage Hispanic youth in the United States. In my home country of Argentina I spent many years working in youth ministry. The La RED meeting helped me to understand the reality of young Hispanics here in the United States: their concerns, their needs. 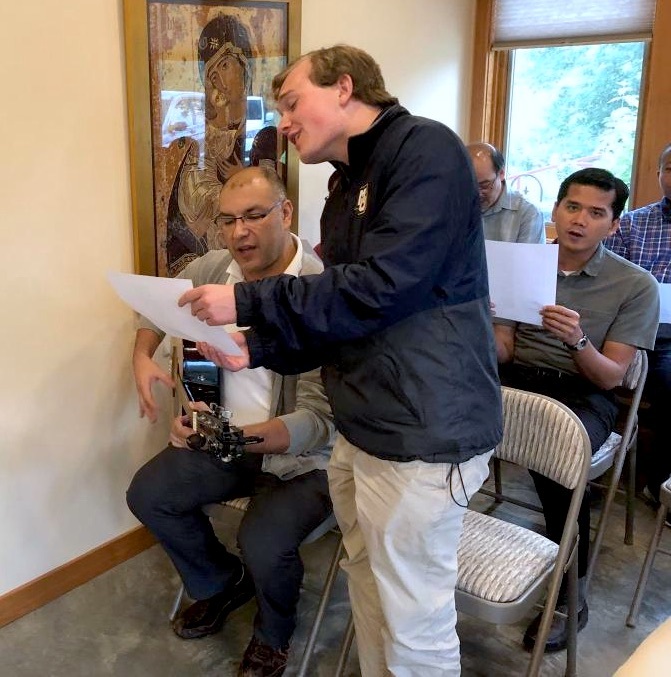 At the Chicago meeting we heard young people speak about being disciples and missionaries with other young people; we heard about the situations in which they live. In small table discussions we thoughtfully listened to each other. We concluded the first day with Eucharistic Adoration; it was touching to see how the young people prayed, taking time in silence to process everything shared during the day. The next day we had discussion tables for particular interests such as teenage ministry, new technologies, and the National Dialogue Project. The National Dialogue is a collaborative effort of the United States Conference of Catholic Bishops, the National Federation for Catholic Youth Ministry, the USCCB National Advisory Team on Young Adult Ministry, the Catholic Campus Ministry Association, and La RED. In order to serve youth, we must hear their voices. They ask us –– the Church –– to accompany them in their growth, but that accompaniment cannot be one-sided. I hope to continue to bring our Dehonian spirituality to young people and those who minister to them. RECENTLY PUBLISHED: As Br. Diego writes, he has been active in youth ministry for many years. 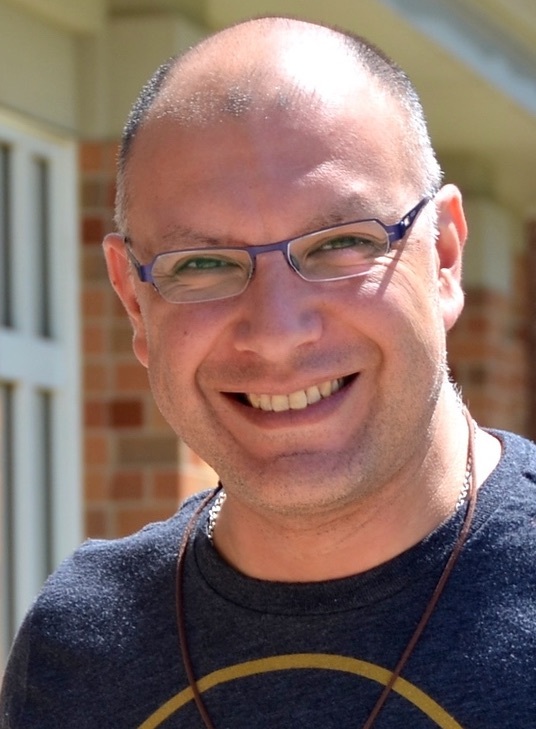 In March, he published a book about the Argentine Province’s summer youth ministry program, a 40-year effort based in the spirituality of Fr. Leo John Dehon. 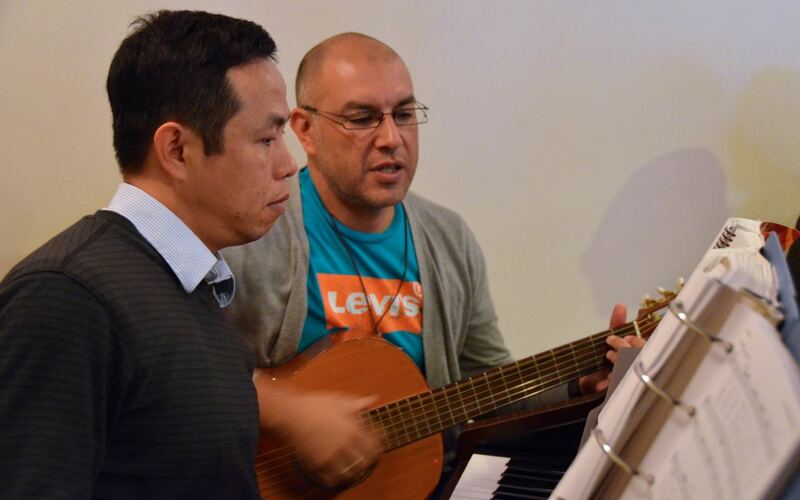 “Accompaniment is a ministry within the Church that is often neglected,” wrote Br. 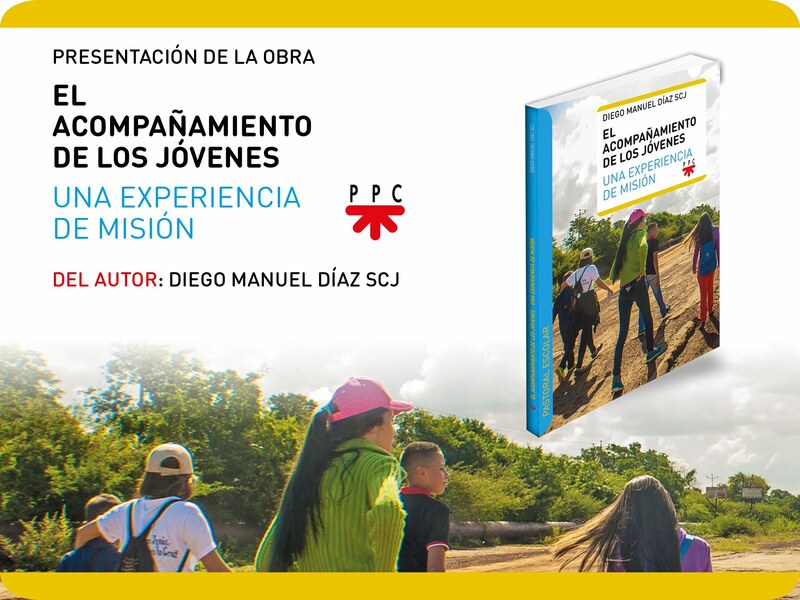 Diego in the introduction to El Acompañamiento de los Jóvenes, una Experiencia de Misión. “My own experience of being accompanied in my first steps of discernment guided me in my decision to seek in the spirituality of the Heart of Jesus a way of living, and a way of accompanying others.” Br. Diego is currently working on an English translation of the original Spanish text. Today we heard about vocations. About how to follow Christ, even if there are many difficulties. We have used the idea that a vocation is a way to the priesthood or religious life; but it is not true. After all, each of us was endowed with a vocation, either as a wife, husband, priest or religious. We are all gifted with the same gift in various forms. And each of us was called to develop this gift and make it beautiful and abundant in fruit. Today, more and more often, we speak about other types of vocations. Maybe sometimes we can call it as a passion to do something. In various professions, how often can we meet people who do their job just because they have to? On the other hand, we can see the other people who do their work with dedication and determination. 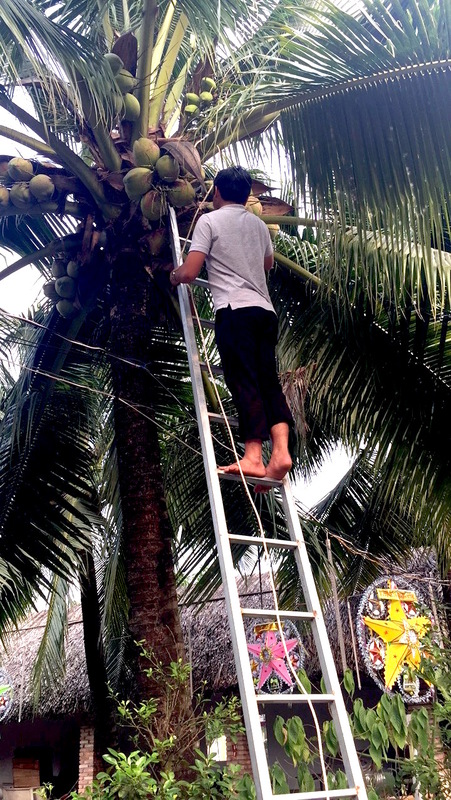 They are called people with a vocation to do this job. For example, a doctor who takes care of his patients, dedicates his time to them, and not just treats them as another client in his office. Or a teacher who allows his students to become enthusiastic to learn about the world. To discover the beauty of art, literature; wonder of biology, technology; ability to use other languages. Today, we are here, together, as one school, which consists of many elements. Administration, staff, professors, teachers, students of philosophy and theology and of the ESL program. It is a very rich reality! Each of us, in his own position, is developing his skills and abilities to become better and better in his own task. We develop our life vocation, but also we develop our professional or student vocation to create a better community. When we all work together, we become a beautiful example of the Church’s community in its diversity and unity. We are here from many countries and continents. Our tasks are different, but we share a common goal – developing of our vocation. Each of us becomes a teacher when we talk about ourselves, our family, our culture and customs. Each of us becomes a student when we are open to meeting another person, who perhaps speaks a little in our common language – English, to know about him, his family, his culture and customs. Today’s Mass with many languages becomes an example of our common opening to the beauty of other cultures; to the beauty of diversity, which, when synchronized, creates harmony and order. This mass invites us to open ourselves to become a teacher who shows the new world and also to be open to being a student who wants to learn about this new world. We are called to develop our calling to follow Christ more and more in daily life. In our Sacred Heart Seminary and School of Theology, we have special conditions for our vocation to develop it in an intercultural way. Three Come and See participants visited our formation program from Thursday to Sunday. It was a packed itinerary. Participants joined the Sacred Heart Monastery community for Holy Hour. This month’s Holy Hour was prepared by Fr. Bob Tucker, SCJ, who focused on two topics: the Word of the Lord and the Eucharist. Participants experienced Dehonian spirituality through the words that were proclaimed, either from the Gospel or from the SCJ Rule of Life. The focus on Friday was the Dehonian formation program. Participants met with staff from either Marquette University or SHSST depending on each person’s educational background and needs. Of course, since the formation community is now in Wisconsin, a visit to Kopps’s Frozen Custard was also on the itinerary. A recurring event in the Dehonian formation program is the First Friday program. 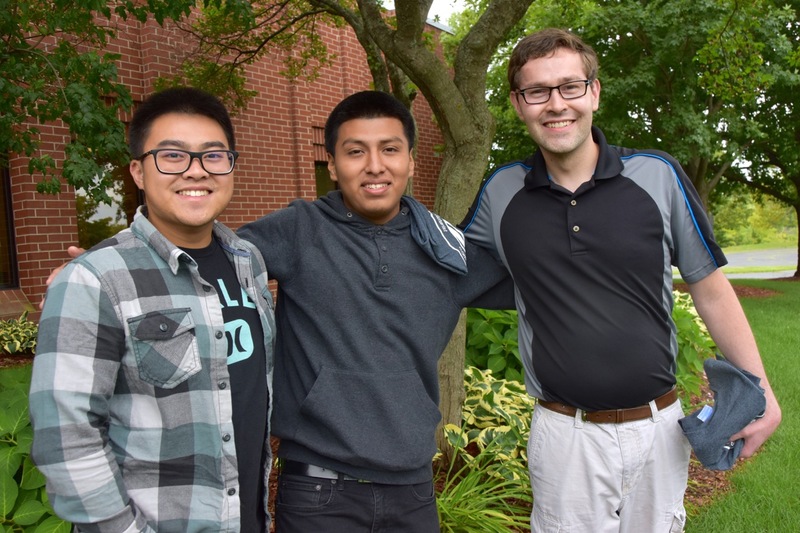 The Sacred Heart Novitiate hosted the first gathering for the 2018-2019 academic year. Fr. 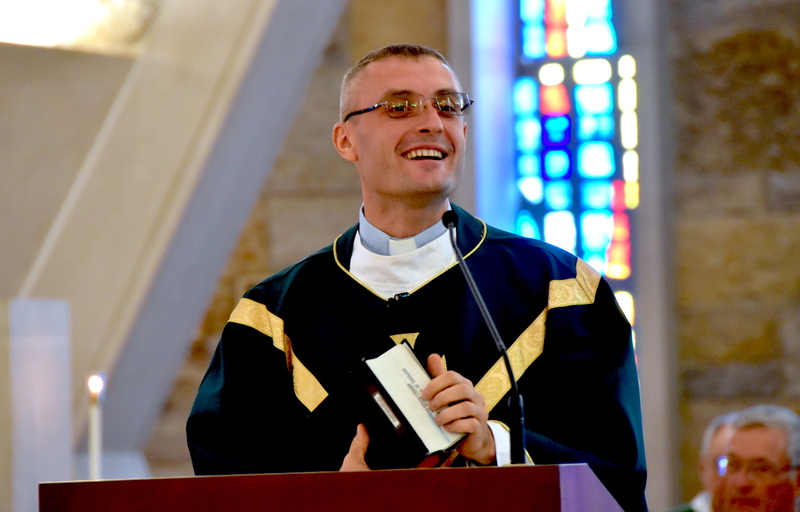 Ziggy Morawiec, SCJ, Vice-Rector of Sacred Heart Seminary and School of Theology, was our speaker. He spoke on the Contemporary Word and Dehonian Spirituality. I saw a continuing theme in the Word as we heard the Word of God proclaimed the day before during Holy Hour. We were reminded that the Word was made by God and that the reality of the Contemporary Word is the language of poetry. To help us understand Dehonian Spirituality on an intimate level, Fr. Ziggy shared a personal story of his life and how love inspired him into action. It was from his experience of the love of the Lord that he professed final vows with the Priests of the Sacred Heart. He has hope for all of us to experience that love in formation and for the rest of our lives. Dehonian spirituality is rooted in the love of the Heart of Jesus. After the presentation, we headed back to Sacred Heart Monastery where Fr. Yvon Sheehy, SCJ, and the community hosted a social with appetizers and games. Saturday, Jacob and I took our guests on a city tour, (I have to say that this was my first time really getting out to explore the city too). We visited McKinley Marina and the lakefront, as well as the Milwaukee Public Market and the Historic Third Ward neighborhood. It was truly a nice day for the city tour. Saturday night, we took part in the province jubilee celebration at Sacred Heart at Monastery Lake. Before they left I asked each of the visitors about their visit and told them that I hoped to see them again. They were all very appreciative of the hospitality that they received from the SCJ community. Why am I a brother? The Priests of the Sacred Heart of Jesus is a religious family made up of both priests and religious brothers. Together, we live the gift of the love of Jesus that impels us to be missionaries wherever the Church calls us. I AM A RELIGIOUS BROTHER because the first call of Jesus is to create in the world a universal brotherhood where we are all brothers and sisters in the same God. 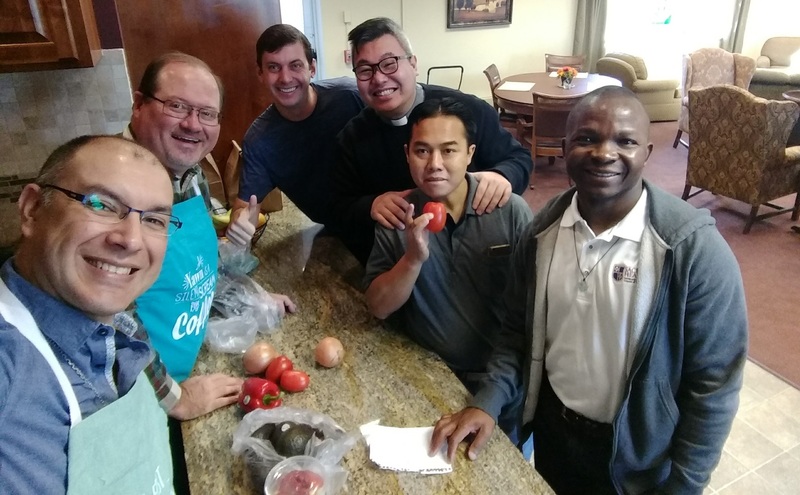 I AM A RELIGIOUS BROTHER because I identify with that aspect of Jesus, to be a brother among brothers, serving from my ministry, creating new bonds of brotherhood and friendship wherever it is needed. I AM A RELIGIOUS BROTHER because our Dehonian mission of oblation and availability makes us intercessors before God, working to make present the Kingdom of God in the realities where we are called to and sent by the community. The vocation of brother is a call to us all, men and women, because the world has a universal thirst for fraternal and egalitarian relationships. The heart of Jesus is the open heart of God who wants to become the brother of humanity and embrace it. Br. Diego playing guitar at a recent liturgy. Br. Diego Diaz, an SCJ from Argentina studying in the ESL program at Sacred Heart Seminary and School of Theology, shares the following reflection that he wrote in commemoration of International Women’s Day, March 8. Women’s Day is celebrated all over the world. Women in many parts of the Earth continue to fight for equal treatment. Sacred Heart Seminary and School of Theology has a good number of women on its staff. They are teachers, admission officers, cooks, receptionists, secretaries, administrators and managers. What struck me the most here is that there is an atmosphere of respect and egalitarianism. Surely there are always things that could improve, but the simple and everyday treatment surprised me; women are not treated as second class citizens here but play an important role in the formation of seminarians. In my experience of ministering to women involved in prostitution I found that respect for others is the key. Men have to know and understand that they must try to see issues from a woman’s point of view and to treat them equally. Many women in the United States carry out tasks that in our Latin American countries are only men’s fields, such as driving a bus, flying a plane, driving trucks or heavy machines, etc. Women’s soccer teams are popular in high schools here, and they perform well. Equality means not just doing the same tasks that men do, but to take it a step further and also recognize the differences of women. Men should take into account who women really are. Equality is not just women dressed as men, or women with male traits. They are simply women, and each is a unique individual who gives color to life on this earth. This is the key to our relationships with each other. What I do every day as my contribution to building a different world is to recommit myself to not being a part of a machismo and dominant part of society but instead walk with my sisters and friends who make history every day in the struggle to be themselves. 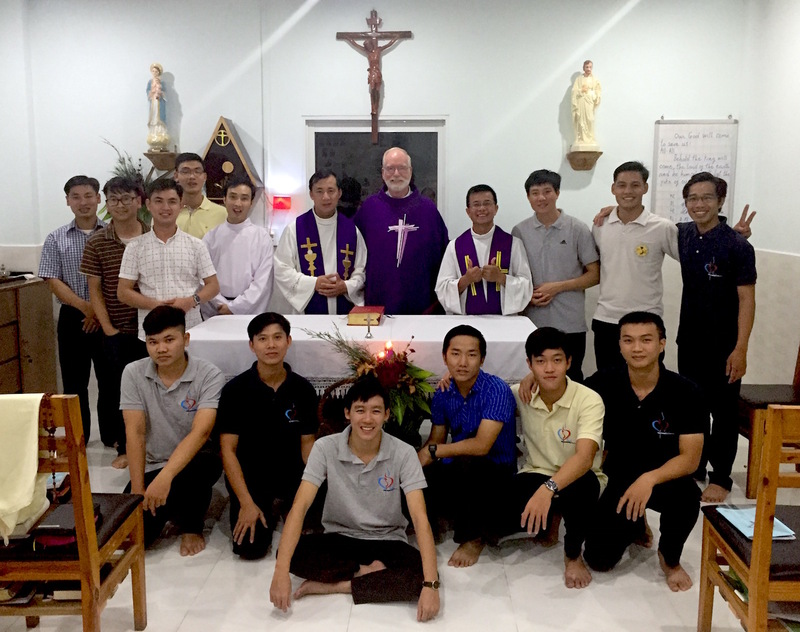 For two weeks in December Novices Henry Nguyen and Paul (Phong) Hoang traveled to the District of Vietnam with Fr. Ed Kilanski, SCJ, provincial superior of the US Province. Fr. Ed went to Vietnam to give a retreat and to meet with Fr. Francis Vu Tran, SCJ (district superior), about collaborative projects for the future. Fr. Ed invited the novices to join him so that they could learn more about the SCJ congregation (Dehonians) outside of the United States. For Henry, it was the first time that he visited the country of his parents’ birth. While there, he met relatives, including his grandmother, for the first time. During his first week in Vietnam he wrote a reflection that was published on the province website. Click here to read it. During our trip to Vietnam I often allowed myself to be “moved by the Spirit” (Constitution #23). Not only was this trip an intercultural experience for me but also an interreligious one as it reminded me of my time in my “Religious Experience in Context” class at Catholic Theological Union. As we traveled around Vietnam, I saw how religion and culture intertwined. An experience that I had while at my Bác Yến’s house was praying for our ancestors by lighting incense and praying for them at the family’s altar in the living room. This is where I connected religion and culture as I was a Vietnamese Catholic and this was more Vietnamese with perhaps a Buddhist influence. As I was mentally preparing to depart from Vietnam my family asked when I was coming back to see them. I can’t help but reminisce about the limited yet well-filled time that I had with my family. I am really thankful for the experience. I do not know when our paths will cross again, yet I know that although separated by an ocean, we are still very connected through prayer and God. Aside from being immersed in my own culture and religious traditions, I continued to have the opportunity to be immersed in something unknown to me. As part of my novitiate year, I wanted to explore more of God’s wonder and beauty, and I was able to do just that as we visited northern Vietnam. We went to Hồ Hoàn Kiếm (Hoàn Kiếm Lake), which was filled with radiant beauty and a rich history of Vietnam. I visited Vịnh Hạ Long (Ha Long Bay); being there reminded me of the natural beauty that God bestows on all of us. Nhà Thờ Chính Tòa Phát Diệm (Phát Diệm Cathedral) was a destination that tourists often visit to see the architecture that is a blend of Vietnamese and European styles. We stopped by Hỏa Lò Prison, also known as the Hanoi Hilton, to see a glimpse of American history in Vietnam. As I was visiting “someone else’s garden” I found comfort and security as no one questioned who I was or where I came from as long as I paid my respects and acted accordingly. It was a continued sense of welcome and hospitality at places like Chùa Một Cột (One Pillar Pagoda) and the Perfume Temple. We also had the chance to visit the largest Buddhist temple in Vietnam, Chùa Bái Đính (Bái Đính Temple). We saw visitors from all over the world there. Candidates Huy and Thanh took me to our Dehon 2 community where I had an experience similar to what my dad had while growing up in Vietnam, which was having a fresh coconut that was just cut down from a coconut tree. Thank you, Thanh, for allowing me to experience that. As Dehon 1 was preparing for a Christmas gathering, the Dehon 2 community was getting ready for their own Christmas event that included neighbors joining them in their festivities. Just before we left Vietnam (literally hours before we got ready to leave for the airport) the Dehon 1 formation community hosted a Christmas gathering for neighbors and benefactors. Over 100 people showed up for the joyous occasion. Dehon 1 – thank you for inviting me to sing and dance with you on stage, although I did not practice as much and as hard as you guys did. I was and still am amazed at your time and dedication in bringing this annual event to the community. As we headed back to the United States on the 3rd Sunday of Advent, I reflected on the readings for the day. The Prophet Isaiah said in the first reading, “The spirit of the Lord God is upon me” and I truly believed that the Spirit was with us as we journeyed through Vietnam, a place that quickly became familiar to me. As a closing note, I reflected on the second reading, St. Paul’s letter to the Thessalonians, to “Rejoice always.” Although I was sad to leave Vietnam, including its good food, and especially the people whom I met and bonded with, I must rejoice for having had this encounter with them. As I “retain what is good” I take this back with me as I continue my novitiate year. I am now back at the Sacred Heart Novitiate, recognizing the three distinctive identities that I carry (Vietnamese, American and Catholic). I know that it sometimes can be hard to carry these identities together, but as long as I am willing and open, I can continue to be moved by the Spirit. I believe that it will help me to discern and do God’s will. I do again want to thank Fr. Ed Kilianski, provincial superior of the U.S. Province, for his invitation to us novices to accompany him on his first trip to Asia. And, thank you to the District of Vietnam for your hospitality! Một ngày nao, chúng ta sẽ gặp lại nhau, nhưng bây giờ luôn trong cầu nguyện. (One day, we will meet again, but for now, in prayer). I can certainly say that my first trip to Vietnam will not be my last!